It’s much easier to exploit people when they are not considered equal, or even human. Here are three examples among thousands that help illuminate the mentality of European and American consumers who may not have thought twice about the exploitation of Congolese people, given the prevailing attitudes of the time. Reflecting broad European sentiment toward African people during the colonial era (1800s through the mid-1900s), the Belgian cartoonist Herge authored a very popular comic book in the 1930s called Tintin in the Congo. The series aimed to create a positive face for the Belgian colonization of Congo, but did so in a way that was very demeaning and racist. 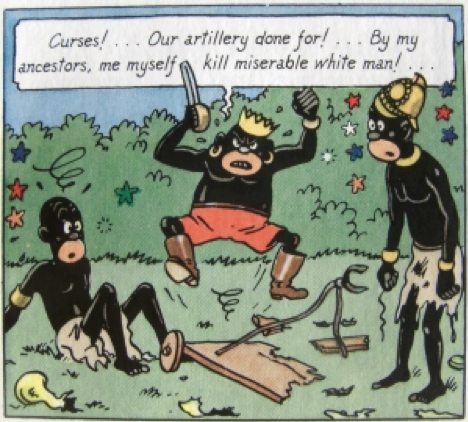 In a study of the comic by ‘Tintinologist’ Jean-Marie Apostolides, Tintin is meant to represent Belgium and the progress achieved under colonialism, providing a model for the Congolese to imitate in order to become more European and thus more civilized in Belgian eyes, but rather ended up as parodies. The book later became embroiled in controversy in both the UK and U.S., eventually being removed from children’s sections of bookstores in the UK and being locked in a special room in the Brooklyn Public Library with appointment-only access. Court cases against the book were filed in Belgium and Sweden but ultimately did not succeed in getting the book banned for its racist content. The story of Ota Benga, a young Congolese who was brought to the U.S. in the early 1900s to be put on display at the World’s Fair and later in the Monkey House at the Bronx Zoo, graphically illustrates many of the themes of this book. With the backdrop of the brutal colonial exploitation of Congo, and in the aftermath of transatlantic slavery in the U.S., there was a widely perceived and even accepted orthodoxy of the superiority of the white race. In this particular case, people profited from “proving” the inferiority of Africans, and Ota Benga’s saga perpetuated and provided space for racist theories that were considered mainstream at the time and continue to percolate even today. But this wasn’t Ota’s first public humiliation. Returning to Ota’s Bronx Zoo ordeal, a month after his internment in the zoo, Ota finally was released, and ended up in a respected orphanage called the Howard Colored Orphan Asylum in Brooklyn, run by the African-American Baptists led by Reverend Gordon. Ota eventually moved to Lynchburg, Virginia as a guest of the Virginia Theological Seminary, where he lived with the African-American family running the institution. Within a few years, though, his desire to go home intensified, and he turned inward and noticeably more somber. Eventually, in March 2016, overcome with sadness and certain he would never get back home because of the difficulties of trans-Atlantic travel due to World War I, he shot himself through the heart. In one of the obituaries, an unidentified friend of Ota’s recalled that Ota claimed he had been captured by an Englishman in Congo when he was around 13. That would have made him around 15 years old when he was displayed in the Bronx Zoo Monkey Cage, and 25 when he ended his life. Ota’s story has inspired many in recent years, including artists, poets, filmmakers, and human rights advocates, and a historical marker was recently erected in Virginia commemorating his life. Back in Congo, ethnic groups comprising the so-called pygmy population remain some of the poorest and most discriminated-against people in the country.